Vail Police Officer Nicola Erb has been recognized by her peers from across the country for her work at the state and national level to call attention to drug-endangered children. 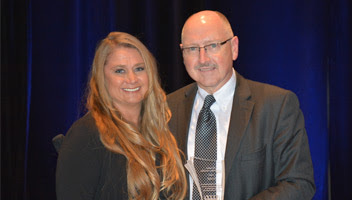 She was presented with the Collaborative Leadership Award last week during the annual conference of the National Alliance for Drug Endangered Children (DEC). Locally, Erb has helped leverage the police department’s relationships with the Eagle County Department of Human Services, the District Attorney’s Office, the Eagle River Youth Coalition, other local law enforcement officers and victim services in working in cases involving issues that impact youth, children and adults. She is the director of the Gore Range DUI Task Force and a trainer in drug issues, impaired driving and elder abuse, all areas where interagency and interdisciplinary collaboration is critical. Erb is one of the founding steering committee members of the national DEC, an organization founded in 2004 dedicated to improving services and conditions for children associated with environments where drugs are used, sold, manufactured or cultivated. The initiative was founded in California in the late 1990s where Erb was one of the charter team members. She later returned to her home state of Colorado and became a member of the Vail Police Department where she has worked, on and off, since 2000. Erb also contributed to the creation of the Colorado Alliance for Drug Endangered Children and later went on to become an organizational consultant assisting the states of Arkansas, Utah, Wisconsin and several others to establish their initiatives, policies and practices. She presents on the topic nationally and currently teaches with Colorado DEC and Rise Above Colorado, a youth focused program, across the state. Officer Erb was recognized due to her career-long commitment to this effort and contribution to the research and development of innovative programming. In 2013, she completed her doctorate degree, where she studied the complexities of issues associated with drug endangered children. Erb’s dissertation focused on promising practices through the eyes of Colorado judges.